Just as gardeners can use 'growth lamps' to stimulate plant growth, materials scientists can now promote uniform growth of decahedron-shaped silver nanoparticles while they are in solution. These 10-faced solids, only tens of nanometers in size (see image), could enhance bio-imaging and biosensing techniques. The new photo-assisted method for use during crystal growth was developed by Xia Yu of the Singapore Institute of Manufacturing Technology and collaborators in Hong Kong and Singapore. Yu and her co-workers based their method on a phenomenon known as localized surface plasmons, which are synchronous movements of electrons that occur, for example, at metal–air interfaces. Using plasmons at the surface of silver nanoparticles, the researchers succeeded in specifically growing these particles to be decahedron-shaped and uniform in size. Their idea was based on antecedent work, which showed that crystal growth of decahedral silver nanoparticles can be aided by white-light illumination. The researchers targeted the plasmons more specifically: rather than use white light, which contains wavelengths across the visible spectrum, they used light with a relatively narrow spectrum, tailored to the frequency of the localized surface plasmons. Yu and co-workers tested a range of light-emitting diodes (LEDs) of different wavelengths and found that illumination with narrow-band light sources did indeed help to grow uniform silver nanodecahedrons. "Also, when precursor solutions containing very small seed particles are irradiated with light of different wavelengths, we can form silver nanoparticles of other shapes," says Yu. During the photo-assisted growth process, particles of varying sizes formed initially, but in the course of several hours they reached a uniform size. Some of the silver nanodecahedrons grow initially to a relatively large size. Although these particles are unstable, they are useful, according to Yu. "The silver atoms on their surface etch away and then serve as a source of silver atoms for smaller nanodecahedrons," she explains. 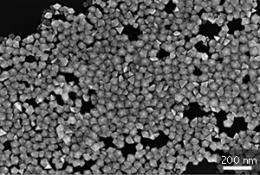 "This dynamic process stabilizes after prolonged irradiation and finally we have uniform silver nanodecahedrons." Yu and her co-workers are now exploring practical uses for their particles. "Silver nanodecahedrons strongly enhance electrical fields when they are illuminated with light," she notes. This can be used, for example, to detect trace amount of molecules on a solid surface. Composite materials incorporating the team's particles could also be applied to bio-imaging and biosensing techniques, where the interaction of light with these materials could help to visualize, for example, anatomical structures, or to detect tiny amounts of molecules.